Gentoo Forums :: View topic - Please, help with the fonts in kde. Which ones were default? Please, help with the fonts in kde. Which ones were default? 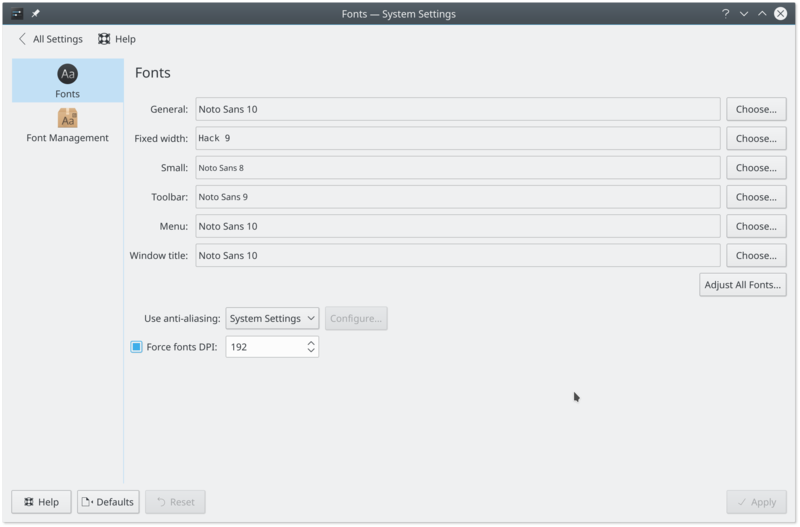 Posted: Mon Mar 25, 2019 7:38 pm Post subject: Please, help with the fonts in kde. Which ones were default? Hello. im using KDE (plasma) since long time ago and actually didnt changed anything regarding a fonts except maybe copying windows Times New roman Courier etc for Firefox from my other pc. Everything else were default, including fontconfig, fonts.conf, hinting antialiasing settings. But it seems like i`ve screwed up my fonts completely yesterday by just selecting another one and pressing Apply in the KDE settings dialog. Even reverting to the defaults didnt help. The fonts became ugly and, more "different" than the ones i`m used to. Too bad i can`t remember which fonts were before, because never paid attention to it`s names. the default fonts (noto Sans?) now are too thin and has more spacing between the letters. So could anyone please tell me which fonts were default for kde and plasma before the Noto. At least since the beginning of plasma 5 or maybe even 4 and if they had changed "on the way". Maybe one of that ex-default fonts is the ones i need back. And also which configuration for the fontconfig is the default for Gentoo (regarding that AA and hinting settings)? Thanks. For everything? What about the monospaced one and for it`s sizes? That`s exactly right as the defaults for now. Didn`t they changed at least once since the release of plasma 4? I`ve seen for example oxygen-fonts were un-merging during the update one day.